One day, in Dannie’s latest update on her continuing family conflicts, she asked my opinion about something. 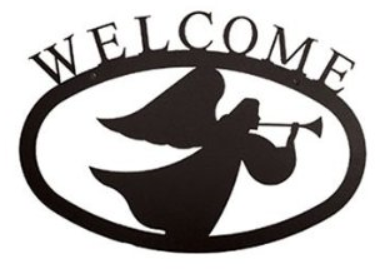 Apparently when Dannie went to her mother’s grave site, she saw a wrought iron angel lawn ornament stuck next to the tombstone, the word “Welcome” in big letters. Dannie was horrified and appalled, especially since she found out later that it was her very own sister who had put bought this for their mother, when her sister had a few too many beers. Dannie removed it and threw it away, only to return a week later to find another one in its place. Wasn’t that terrible? Her eyes met mine and we both burst out laughing at the same time; a rollicking, easy, raucous laughter that, I found out later, had quite a few of the other offices in the hall wondering what in the world was happening in Theresa’s office. Dannie and I were bent over, laughing, until tears ran down our faces. An angel in a cemetery – okay, but a welcome angel? Not long after, I heard that Dannie had passed away. “Oh no…” My sadness was immediate. I was afraid to ask, but I had to ask, how she died. A suicide? No. An overdose? No. As a result of physical abuse? No. The answer – “of natural causes” related to the condition we knew about. Her body shut down; it was time. Thank you, Dannie, for the gift of your generous and strong spirit. You mattered. You made a difference. You shine in my heart, and in my memory. I am so blessed. This entry was posted in Humor & Pathos, They Have Touched My Heart and tagged abuse, addiction, angel, blessed, journey, therapy. Bookmark the permalink.